Is it worth entering writing competitions? Last year, I heard about a competition organised by an independent theatre group that was looking for new writers. The prize was to work with a director on refining the script and then to have your play staged. A representative from the theatre company spoke to a group of writers, including me, and told us there were no preconceived ideas about what kind of play they were looking for. We should let our imaginations run free. Recently, I saw the two winning plays and they were brilliantly staged. But they were also something of a let-down: they covered religious conflict, teen pregnancy, and knife crime. They’re difficult issues, but they’re very easy from the point of view of commissioning theatre. Nobody is going to complain if someone invests money in those kind of productions because it’s just what theatre groups are expected to do. It would have been truly daring to commission a farce, a sci-fi play, or anything else that felt a bit fresher. That would have really helped to discover new voices. I hadn’t submitted anything for this particular competition (I didn’t have a strong enough idea, and I was working on promoting Web Design in Easy Steps, and writing iPad for the Older and Wiser at the time). Watching this play made me realise that I’m highly unlikely to ever write the kind of play that could win, though. I ended up quite pleased that I hadn’t found the time to submit an entry because I’m just not the kind of writer they’re looking for. I’ve entered a few writing competitions over the last couple of years when publishers have been looking for someone to write stories for their characters or plot outlines. I was a close runner-up twice in competitions organised by one publisher, which is a frustrating place to be, although it’s possible I might be lucky third time around if I give it another go. Seeing this theatre production and thinking about my recent competition entries made me question whether it’s worth entering writing competitions. The upside is that the prizes can be hugely beneficial: they can raise your profile and give you new creative opportunities to find an audience and tell it a story. If a competition prize helps you to create a new work, you’ll learn a lot along the way, usually from people with much more experience than you. Competitions are often the most approachable way to break into a new style of writing too, because they welcome all-comers. But the downside is that you’re writing to somebody else’s agenda, and sometimes you don’t even know what that agenda is. There will nearly always be safer options for the judges to choose than your work. There might be entrants with a stronger track record, or stories that tick more boxes. You’re also going where the competition is fiercest. There might be hundreds or thousands of writers who are writing something to the same brief as you are. When the judges are choosing from similar submissions, how can you make your work stand out? Minor differences between the submissions become hugely important, in a way that they wouldn’t in most other contexts. Whenever you write, you’re in competition, of course. You’re vying with other writers to win an agent’s representation, a publisher’s budget, and a reader’s attention. But when you come up with your own projects, you can use your ideas and style to differentiate yourself and stand out. You might be the only person who’s writing fiction about how technology is affecting the music industry, or at least you’ll be within a select niche. When you enter formal writing competitions, you have to run with the herd. Not all competitions are the same. Some give you a lot of freedom to shape the story to your own vision, and to take the characters in new directions. Some give you detailed feedback, which might be valuable, depending on who’s giving it. And some have prizes that, even with the odds stacked against you, are well worth the gamble. Many will push you outside your comfort zone, and teach you something about writing, purely through the experience of creating your submission. You only become a better writer by practising, and I don’t regret spending time on anything I’ve written. Writers should remember, though, that their time is precious and they can only write one thing in any given moment. It’s easy to get seduced into entering competitions, instead of cracking chapter one of your new novel, which perhaps begins a more difficult journey. What do you think? Are writing competitions worth the time? What’s new in the Apple iPad 3 (or iPad HD)? Apple has unveiled the iPad 3, and perhaps the most surprising thing is that there were few surprises. There had been so much speculation before its release, some of it informed by leaked photos of parts and some of it possibly planted, that there was already some consensus on what would be introduced in the iPad 3. There were a few predictions that didn’t come true, including a fascinating story in The Guardian about a haptic technology that makes the flat screen feel like it has texture, so you can feel the edges of keys, for example. There were rumours the Home button would be removed so that all the controls are gesture-based, although this seemed unlikely, both for usability and branding reasons. We now know that there are two main changes: the first is that the camera quality has been improved. It still lags behind the iPhone’s camera quality or a dedicated digital camera, but it’s significantly better than the iPad 2. Until I get my hands on one, I won’t be sure what kind of shots it will be good for, but the previous camera was only really suitable for video calling or for quick grab shots. It couldn’t be used as a real camera, to make photos you’ll want to keep forever. Hopefully, the iPad’s new camera will be much closer to what we would expect from a camera phone. The other main change is that the screen resolution has doubled, so text and images will look sharper. The device will be able to play back HD video at its full resolution, which led to some speculation that the device would be called the iPad HD, although there’s no indication of that on Apple’s website. Apple just calls the device a third-generation iPad. Apple says the higher resolution has no significant impact on battery life, which is good news. There are a few other changes that will be less obvious. The iPad now supports 4G mobile communications, but since there isn’t much coverage for these in the UK, that’s unlikely to make much difference here. You can use your iPad’s mobile connection to create a wi-fi hotspot for other devices, although this is probably of most use if you’re getting superfast 4G speeds in your mobile connection. The new iPad also has a new processor, called the A5X, which has double the graphics processing capability of the previous processor, so it can manage the enhanced screen effectively. 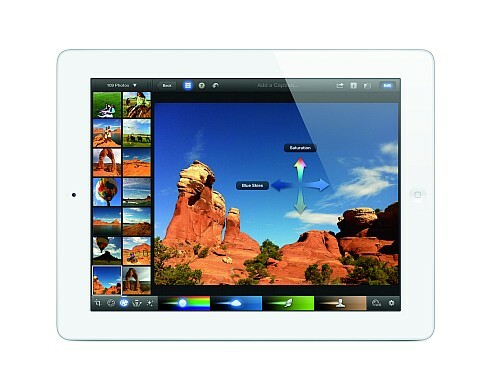 The release of the iPad 3 also came with some software enhancements. The camera app has been redesigned, most notably so that the button to take a photo is somewhere you can actually reach it without having to juggle the iPad with one hand. It’s now possible to delete photos from the Photo Stream folder on the iPad, although that delete instruction doesn’t seem to synchronise with other devices, so you’ll need to delete the photo on your other devices too. The camera is also said to have face detection built-in, so that it can optimally balance the exposure across all the faces in your photo. Apple says it’s also improved the sound quality on the iPad so that films and TV shows sound better. All these features, plus some bug fixes, are available to owners of older iPads who upgrade their iPad software to version iOS 5.1 (obviously, you still need an iPad 2 with a built-in camera to use the Camera app). If you’re not yet running iOS 5.0, see my guide to upgrading to iOS5. If you have upgraded to iOS 5.0, you can upgrade again to this latest version iOS 5.1 by going into your Settings app, tapping General, then Software Update. There’s also a new software feature which Apple hasn’t rolled out to older iPads, which is a new dictation button on the keyboard which enables you to dictate text to the screen. At first I thought this was a simple software feature that could easily have been given to those with older iPads, but on reflection, voice recognition is quite processor-intensive, so it might need the new A5X chip to work. Apple has also released iPhoto for the iPad (pictured, above). When Apple announces a new application like this, I feel a little conflicted. On the one hand, it’s great that they’ve invested in creating new software. On the other hand, given the device costs about £500, it wouldn’t hurt them to give away the software, rather than charging £3 for it, which almost seems petty. When you buy a new Mac, you get iPhoto, iMovie and Garageband for free, and these are all sold separately for the iPad. Apple did introduce basic photo editing capabilities in the iOS5 software upgrade for the iPad, so perhaps I shouldn’t grumble about them making enhanced features available to those who are prepared to pay a bit for them, given they have to invest resources in creating the software. The iPad 3 will be released on Friday 16th March and Apple is taking pre-orders now if you’re interested. Amazon doesn’t have a proper listing for the iPad 3 yet, but I expect other retailers will be advertising it for sale and pre-orders over the next few days. (Corrected, with thanks to Michael Hülskötter, to clarify that the quad-core is for graphics only).